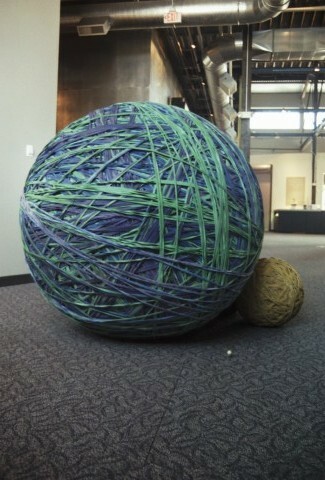 During the 2005 Eastern Tour, the World's Largest Ball of Rubber Bands came to me... Actually, to the contemporary art facility in which I was an artist in residence. It arrived on a tilting flatbed, with a team of East Coast transporters. They rolled the ball to the end of the truck, and as an example of its massive mass, allowed its weight to tip the truck off its front wheels. After a wobbly trip through the back entrance to the gallery, it sat proudly in the foyer for school groups to ogle... Unfortunately it also tended to exude the aroma of old rubber when in direct sunlight. 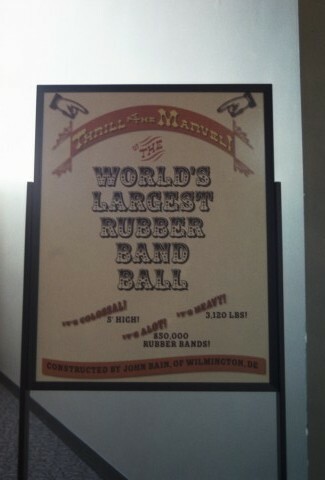 Created by John Bain, started when he worked in a mailroom, the ball is made up of whole rubber bands stretched, not a series of smaller ones tied together. To make that possible, he talked a rubber band company into making progressively larger and larger bands to stretch over the almost 5-foot circumference. He also sold his own Rubber Band Ball Challenger kits, at a hefty $18 (as compared to the competitor offering at a mere $3). And, in the ever-changing world of World's Largest Things, it just came up for auction on Ebay. Sold in live auction format, the stats listed three bids, bringing the opening price of $5000 up to $7000. No news on who actually purchased the ball, or if it will meet the same fate as the former record holder. Cost of materials approx. $25,000.